Today I want to do some typical conventional Bangladeshi dish for me. 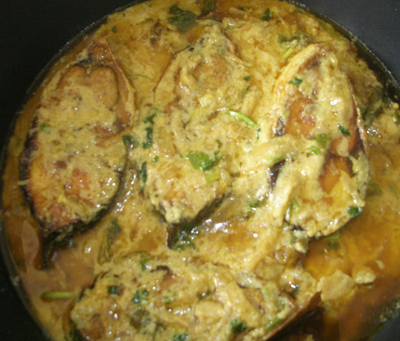 For Bangladeshi people the most conventional, desirable and all time favourite food is Ilish. So I will do something with ilish. I will do sorse ilish. But I won’t do it in conventional way (Don’t kill me Ma). Because living in abroad I or we hardly get fresh Ilish and hardly anyone has mortar and pestle (pata puta).So I try to make sorse ilish user friendly for abroad kitchen. Try once and give your opinion. Your positive or negative opinion will inspire or improve me. Remove the fish and in same oil fry the onion till it becomes soft. Add bay leaf, mustard paste, onion paste, salt and sliced chillies with 3 tablespoon water. Cook them till oil comes out. Add 1 and 1/2 cup of water and when it comes into boiling point add the fish. Let it cook covered till the fish is cooked through. Add coriander leaves and mustard oil and take off sorse ilish from heat. Serve hot sorse ilish with rice. Amazing! I can Smell the fish!